He may be called Lil Baby but he ain't gonna do some baby talk. He's a mean slick machine who dishes out the smoothest hip-hop grooves and the catchiest rhymes. As he dropped the word about his much-awaited tour entitled "New Generation", covering several cities and states, fans were in a state of frenzy. 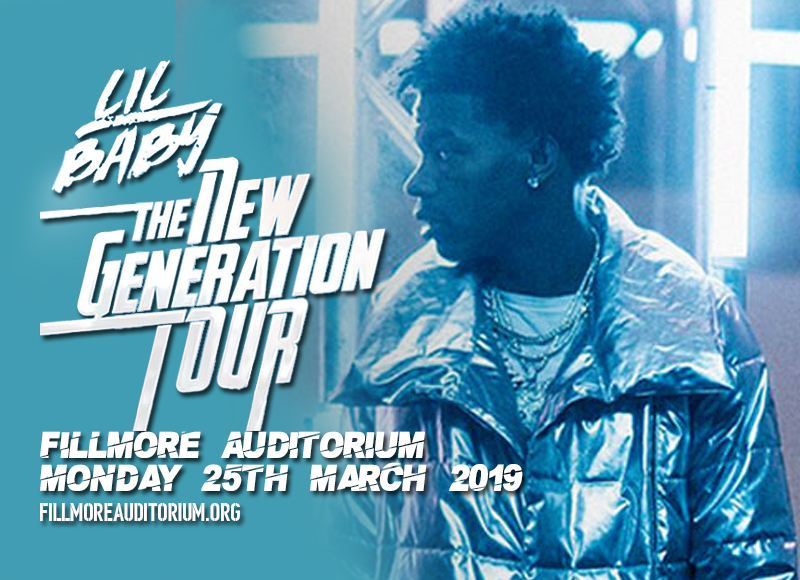 And on this side of town, fans were ecstatic to know that Lil Baby will go rap-a-bye-baby as he hits the stage of the Fillmore Auditorium on Monday 25th March 2019. Tickets are on the fly as of this writing, so it may be here today and gone tomorrow if you wait too long. Don't leave it to chance. Act and start booking those tickets now. Lil Baby started his career, not with baby steps, but rather he hit the ground running in early 2017 starting off with "Perfect Timing", his first EP; and released four EPs during that year alone. Word got around about this prolific and hard-working artist, thus, a record label wasted no time in signing him up, which led a major collaboration with mammoth rapper Drake in 2018. That same year, Lil Baby's Harder Than Ever album was released of that same year. His biggest mainstream hit "Drip Too Hard" with Gunna charted at No. 4 on the Billboard Hot 100 chart, and gained over 100 million plays on streaming services. Along with a succession of album, EPs, and single releases, Lil Baby was striking while the iron was hot, so to speak. He also took the relentless touring route which gave him the proper audience exposure and gaining more and more followers along the way. "New Generation" is Lil Baby's latest tour de force which include labelmates City Girls and fast rising West Coast rapper Blueface as the main supporting acts. Jordan Hollywood, Marlo, Rylo Rodriguez and 42 Dugg complete the stellar cast which will hit the Fillmore Auditorium on Monday 25th March 2019. Don't miss it!